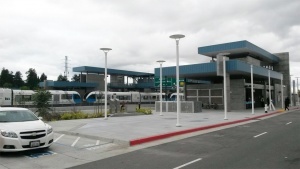 Antioch is the eastern terminus for the Antioch - SFO line. Diesel multiple unit trains (eBART) start trip from this stop to Pittsburg/Bay Point Station, where passengers transfer to mainline BART trains toward SFO. Ticket machines (Clipper card only) are available at station entrance. First time riders must purchase a reusable Clipper card from a vending machine before boarding. All riders must pass through the faregates with a valid BART ticket or Clipper card. Keep the ticket or card for the ride and use it to pass through the faregates again when exiting the station. Platform 2: to SFO Platform 1: Drop off only.